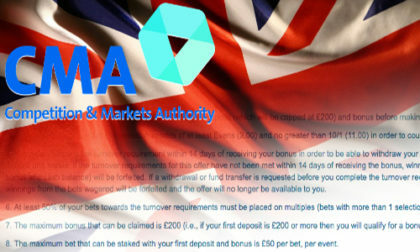 The United Kingdom’s Competition and Markets Authority (CMA), seemingly tired of a neverending parade of misleading (and sometimes outright bogus) sign-up promotions and bogus offers, has announced an impending enforcement action against multiple gambling operators over breaches of the UK’s consumer-protection laws. In addition to what the CMA terms as an array of promotional terms and conditions that are “confusing and unclear,” the CMA action will also address operators that consumers have alleged to unfairly hinder bankroll withdrawals. The enforcement action is the outcome of an investigative process that the CMA began last year, in conjunction with the United Kingdom Gambling Commission. In conjunction with the expected enforcement proceedings to be launched against an indeterminate number of still unidentified operators, the UKGC will also be using the ongoing situation as a lever to reinforce consumer-protection standards, ensuring compliance from the gambling industry. “Whilst the CMA takes enforcement action on how consumer legislation is followed, the gambling industry should be under no illusion that if they don’t comply with consumer law, we will see this as a breach of their operating licence, and take decisive action,” added Harrison. Nisha Arora, the CMA’s Senior Director for Consumer Enforcement, said, “We know online gambling is always going to be risky, but firms must also play fair. People should get the deal they’re expecting if they sign up to a promotion, and be able to walk away with their money when they want to. “Sadly, we have heard this isn’t always the case. New customers are being enticed by tempting promotions only to find the dice are loaded against them. And players can find a whole host of hurdles in their way when they want to withdraw their money. The CMA announcement declared that it has already identified “a number” of operators who are currently violating the UK’s consumer-protection laws at the present time. Significant fines for operators are the likeliest outcome, with those fines increasing for repeat or chronic offenders. The CMA possesses what it describes as “a range of powers” to deal with operator violations, up to and including the suspension or termination of operator licenses. Having identified a number of operators engaging in practices likely to be breaking consumer law, the CMA is now taking enforcement action and has a range of powers at its disposal to bring any illegal activities to an end. The CMA did acknowledge that it has not reached a final decision on whether the terms and practices it is concerned about breach consumer protection law. Operators will have the right to present their own arguments regarding the alleged violatins. If necessary, according to the CMA, court action will be taken under the 2002 Enterprise Act and other applicable consumer laws.